Document not saved. : Is There A Problem Here? : Document not saved. I have an Excel document that I cannot save. 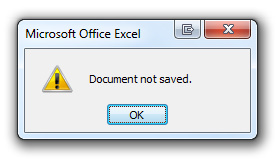 Every time I try to save, Excel displays the above dialog stating "Document not saved." While I'm glad to be informed that the unsaved document was not saved, I'd prefer to be given more any information about the cause and required remedy.